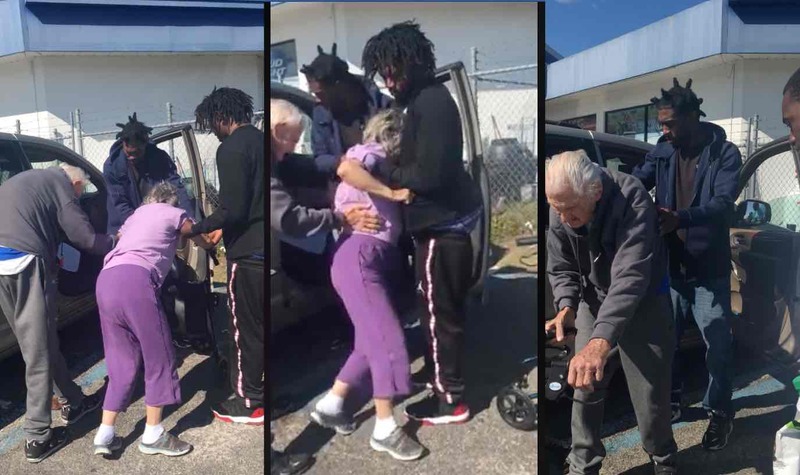 Three young men are being praised for coming to the aid of a 100-year-old man who was having trouble helping his exhausted wife into their car’s passenger seat. The good deed was caught on camera thanks to Officer Kanesha Carnegie of the Levy County Sheriff’s Office in Bronson, Florida. The policewoman had been in a gas station parking lot in Williston when she saw 89-year-old Rose Griest struggling to get back into her car. The elderly couple had reportedly stopped on their way to a medical appointment in order for Griest to use the gas station bathroom. Upon returning to the car, however, Griest was so exhausted from the trip she could barely stand. Carnegie was about to go over to offer her assistance to the Griests when she saw three young rappers from the neighborhood approach the couple and help them into their car. Carnegie, who recognized the three friends as Joc Koe Stoe, Marty, and Freddy G, instead asked their permission to film the exchange so she could inspire other people with their act of compassion. Since uploading the video to Facebook last week, it has been viewed millions of times.